Wednesday, the Federal Open Market Committee voted to leave the Fed Funds Rate unchanged within its current target range of 0.000-0.250 percent. The vote was 7-3 — the second straight meeting at which the FOMC adjourned with as many 3 dissenters. Prior to that last meeting, there hadn’t been 3 FOMC dissenters since 1992. The Fed also said that there are “significant downside risks” to the economic outlook, tied to strains in the global financial markets. The news wasn’t all bad, however. The Fed noted that business investment in equipment and software continues to expand, and that inflationary pressures on the economy appear to have stabilized. The Fed then re-iterated its plan to leave the Fed Funds Rate in its current range near 0.000 percent “at least until mid-2013”. This means that Prime Rate — the rate to which credit card rates and lines of credits are often tied — should remain unchanged at 3.250 for at least another 2 years. Furthermore, as expected, the Federal Reserve launched a market stimulus plan aimed at lowering long-term interest rates. The Fed will sell $400 billion in Treasury securities with a maturity of 3 years or less, and use the proceeds to buy the same with maturity between 6 and 30 years. Mortgage market reaction to the FOMC statement has been positive this afternoon. Mortgage rates in Tennessee are improving, but note that Wall Street sentiment can shift quickly — especially in a market that’s as uncertain as this one. If today’s mortgage rates and payments fit your household budget, consider locking in a rate. Rates can change swiftly. 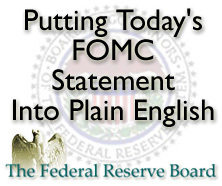 The FOMC’s next meeting is a 2-day affair, scheduled for November 1-2, 2011.